20 July, Hong Kong – The free computer science club, kids-run Google CS First Club Hong Kong was successfully launched by First Code Academy (FCA) in their campus this month. During the training in CS First Club fourteen underprivileged Hong Kong primary school students from the Boys’ & Girls’ Clubs Association of Hong Kong successfully created their own animations and games. 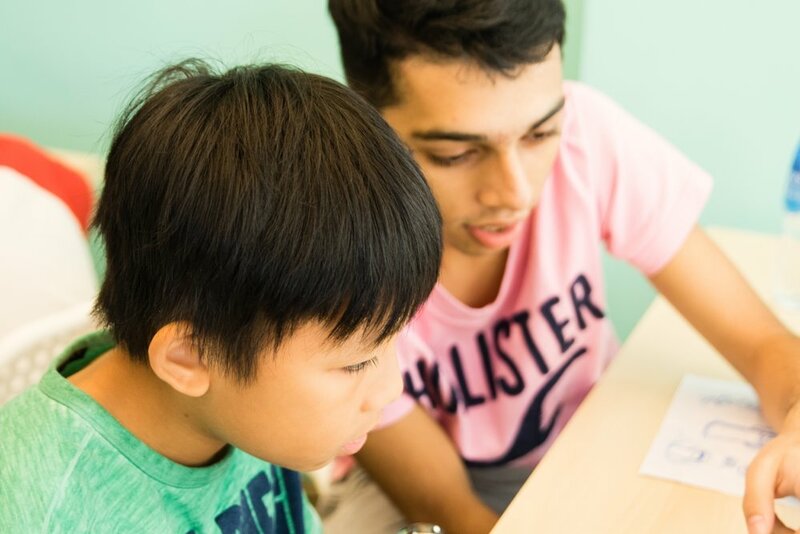 Aadi Anand and Isaac Li, 11-year-old and 12-year-old students of FCA and recent MIT AppInventor Summit 2016 award winners, have already signed up to volunteer as teachers (gurus) for the CS First Club class in August. Google’s CS First started as a pilot program in the United States in 2013, and since then it has made an impact on over 435,300 students globally. At MIT AppInventor Summit 2016, the bi-annual gathering of the world-wide AppInventor community hosted at Massachusetts Institute of Technology, Boston in June 2016, Aadi Anand and Isaac Li worked as a team and made an app called RecycleCare which won third place Experienced Developer Award at the Expedition Hack hackathon. With First Code Academy providing the location, coaching, recruiting and training for CS First Club, Aadi and Isaac are thrilled about having the platform to share what they had learned with their peers. “I was quite nervous when I presented my coding projects for the first time a few years ago, but now I am not really nervous anymore. And in fact, when I knew I needed to do a presentation during the MIT AppInventor Summit, I felt so excited! Coding is a powerful tool as it is a way to instruct the computer to help us do a lot of different things, and I dream to start a company with the use of coding in the future. Right now I am looking forward to sharing my knowledge with students of my age at CS First Club,” said Aadi Anand. In Hong Kong, the common teaching practice is almost always the adults teaching the children. In contrast, CS First Club by First Code Academy is the first of its kind that has kids teaching kids coding. The club encourages children who have coding experience (coding gurus) to share what they have learned with their peers, which will mutually benefit both the gurus and the learners. From preparing the classes to organizing activities for the learners, the gurus have the opportunity to improve their leadership skills and to practice their coding knowledge. On the other hand, learners are led by their peers to explore computer science as a new tool to create, just like being shown their first Lego set. Compared to being taught by adults, the first group of learners found coding less intimidating and more fun when it was introduced by young coders. “I saw other people making games in Scratch before and I also wanted to try it myself but we don’t have any coding class in our school. After making some mistakes, I finally made my own game in the CS First Club! We even got to share our projects with the whole class. The teachers (gurus) and the volunteers are also very kind and helpful. I learned that we could create a lot of things with coding and I want to have this class again in the future,” said Yannis, a 10-year-old learner at the CS First Club. Enoch, a 9-year-old student was also amazed by his CS First Club experience. “I started to understand the programming language and learned how to solve problems during the process of making an app. I also made my own animation! Although I was a bit shy at the beginning, I soon got along well with the gurus. I would really want to join classes like this again,” he said. As one of the key partners, First Code Academy has been actively involved in this program, and hosted it in their own campus in Yau Ma Tei, Kowloon. “As a free program, CS First Club’s goal is aligned with First Code Academy’s mission, which is to empower our next generation to become creators with technology. We believe that our children should be empowered to use computer science as a tool to bring their ideas to life. That is why we support CS First Club program of which the goal is to increase student access and exposure to computer science,” said Michelle Sun, founder of First Code Academy and the organizer of the pilot CS First Club Hong Kong. The pilot kids-run CS First Club Hong Kong is also supported by the Boys’ & Girls’ Clubs Association of Hong Kong (BGCA). Fourteen kids from underprivileged families, who lack access to computer resources, were the first group of learners in CS First Club Hong Kong. With the success in hosting the first session of CS First Club, First Code Academy will continue to run this program in August at their new Kowloon campus. Our future creators are not only eager to learn coding, they are excited to share too.